Maples are a varied group. They may be large and midsize shade trees; smaller trees; and dainty, picturesque shrub-trees. Leaves range from simple ovals to deeply lobed and finely dissected shapes. One element common to all maples is the fruit (seed capsule), which resembles a hardware store wingnut. Many maples have beautiful fall color. Look for one that colors well in your locale; visit nurseries while the foliage is changing hue. The larger maples have extensive fibrous root systems that take water and nutrients from the topsoil. The great canopy of leaves calls for a steady, constant supply of water, not necessarily frequent watering but constantly available water throughout the root zone. Occasional deep watering and periodic feeding will help keep roots deep. Medium to large maple species need little pruning. On smaller types, prune to accentuate the natural shape. To minimize sap bleed, make any cuts in summer or early fall in mild-winter areas, from summer to the end of January where temperatures remain below freezing. Native to Japan and Korea. Slow growing to 20 ft. with equal or greater spread. Normally many-stemmed. Most airy and delicate of all maples. Leaves 2–4 in. long, deeply cut into five to nine toothed lobes. All-year interest: young spring growth is glowing red; summer leaves are soft green; fall foliage is scarlet, orange, or yellow; slender leafless branches in greens and reds provide winter pattern. Grafted garden varieties are popular, but common seedlings have uncommon grace and usefulness: they are more rugged, faster growing, more drought tolerant, and they stand more sun and wind than named forms do. 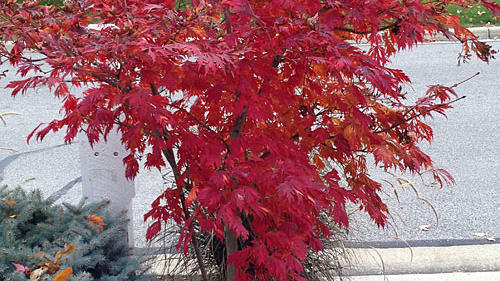 Japanese maples thrive everywhere in the Northwest, where they make good small street trees. They can be grown with success in California if given shelter from hot, dry, or constant winds. Filtered shade is best, but full sun can be satisfactory. In California, consider the local soil and water; wherever azaleas are difficult to grow and suffer from salt buildup in the soil, Japanese maples will show burn on leaf edges. Resistant to oak root fungus. Used effectively on north and east walls, in patios and entryways, as small lawn trees. Attractive in groves (like birches) as woodland planting; for natural effect, set out plants of different sizes with varying spacing. Good under oaks, as background for ferns and azaleas, alongside pools. Invaluable in tubs and for bonsai. Japanese maple is inclined to grow in flat, horizontal planes, so pruning to accentuate this growth habit is easy. The grafted garden forms are usually smaller than seedlings, more weeping and spreading, brighter in foliage color, and more finely cut in leaf. Purplish or bronze to bronzy green leaves, brighter in sun. Holds color all summer. Vigorous, upright growth to 15 ft. tall and wide. Blackish red bark. Deep red spring and summer foliage, scarlet in fall. To 12 ft. high, 15 ft. wide. Deep burgundy leaves are deeply cut for a lacy look. Branchlets are bright green. Small, shrubby, 9-ft. mound with finely cut leaves that hold deep red color all summer, turn scarlet before dropping off in fall. Small shrub to 6 ft. high, 12 ft. wide, with drooping branches, green bark; pale green leaves turn gold in fall. This grows into a 7-ft. mound with nicely weeping branches. Very old specimens reach twice that size. New growth emerges red and covered with silvery gray hairs. These soon disappear, and the tree’s finely divided, lacy, purple-red foliage holds well into summer before becoming infused with green. Fall color is crimson. Upright grower, becoming wider with age; eventually makes a round-topped tree 20–25 ft. tall and wide. Large leaves (to 5 in. wide) turn from rich green in summer to brilliant crimson in fall. Considered by many to be the Japanese maple with the best fall color. Tolerates sun and heat. Upright grower to 20 ft. tall and wide. Resembles ‘Atropurpureum’, with bronzy purplish leaves in summer, but more vigorous. Has long, arching branches. Grows fast when young, eventually to 20–25 ft. high, 18–20 ft. wide. Before leafout, twigs and budding growth are striking red. Leaves are tinged with red along edges when they emerge, shift to bright, lighter green in summer, then go gold with apricot highlights in fall. In winter, bark is coral red (most pronounced in younger growth). Crotch angles are steep in this tree, so it tends to break in wet snow, sometimes destroying the tree. Upright grower to 10–12 ft. high and wide (this is the only widely sold, upright-growing laceleaf maple). Lacy, finely divided leaves are reddish in spring, green in summer, then golden yellow touched with crimson in fall. Vase-shaped tree grows slowly 10–15 ft. tall and wide. It is densely clothed with leaves that are very dark green, deeply lobed, heavily crinkled, and have lots of substance, so they rarely sunburn. Yellow to orange fall foliage. Prized among collectors. Forms a weeping mound 4–6 ft. high and twice as wide. Green leaves are finely cut, fernlike, and elegant. Brilliant yellow and gold fall color. Vigorous, upright grower to 20–25 ft. high, eventually wider than tall. Leaves deep burgundy, slightly darker than those of ‘Bloodgood’, holding their color well into summer. Deep crimson fall color.